Situated in the emerging foodie city of El Segundo, Chef Anne- also co-owner of the restaurant Sasual- teamed up with The Bruery for a good cause: Free Wheelchair Mission. 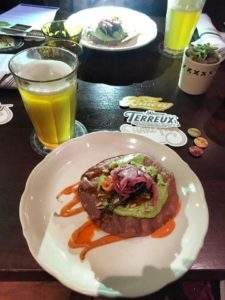 The event featured a tasty four-course meal specifically paired with beers from The Bruery with all proceeds benefitting that Free Wheelchair Mission, a non-profit organization that provides wheelchairs at no cost to people with disabilities living in developing nations. Don’t miss the chance to try the delicious food at Sausal or a beer from The Bruery in Orange County. It’s definitely worth the visit. First Course: Avacado Tostada, Caramelized Brussels, Guajillo Butter, Queso Fresco, Sunflower Seeds, Arbol Salsa and Pickled Red Onions with a Jardinier Belgian- Style Pale Ale. Second Course: Grilled Artichote Chicken, Roasted Squash, Hominy Grits, Smoked Cashews, Cashew Crema, Tomatillo Salsa with a Humulus Terreux Hoppy 100% Brett Pale. Third Course: House Chorizo, Chihuahua Cheese & Weiser Farms Potato Enchiladas with Midnight Black Beans accompanied by Share This: Mole Spiced Imperial Stout. Fourth Course: Tres Leches Cake with Camote Milk accompanied with a Or Xata Blonde Ale with Rice, Cinnamon and Vanilla. For more information, visitFree Wheelchair Mission. To try the menu, visit Sasual and The Bruery.